Dressing for the weather just seems like common sense, but there are a few extra things you can do to help your voice out. Anytime your body shivers, you are creating tension, which directly impacts your sound. Make sure you’re wearing enough layers so that your body doesn’t need to shiver to create warmth. Protect your neck with a scarf, and try to cover your mouth and nose if it’s really cold outsie. It can be easy to forget to eat well, since we often turn to more comfortable food fare during the winter months. It’s especially important before a concert to ensure that you’re giving your body the best food and drink possible, so that you can be at your best. Hydration is especially important during winter months, since we often have to exert ourselves more, and the city is so dry in the winter. Make sure you’re drinking enough water! It’s important to always warm-up before singing, but this becomes especially important during the winter months. Because of the dry air, and the cold air, our bodies produce more mucus, and dries our throat out. Give yourself an extra few minutes to warm up, and make sure to hydrate as you sing! 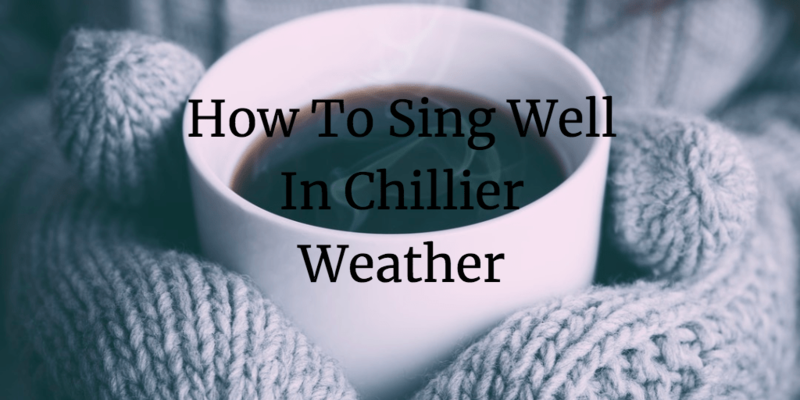 How else can you prepare yourself to sing well in chillier weather? Tell us in the comments below! Your contribution helps us continue to provide high quality, accessible choral music education to children. Singing for the joy of it! Looking to keep up to date on the choir? Keep on top of the upcoming concerts! Useful info for members and fans alike! Calgary Children's Choir | AB | Canada Contact: (403) 210-3499 Copyright © 2019 CCC. All Rights Reserved.